With Princess Kakyu in the picture, it’s time to get some answers! About how she was able to hide in a censer and defeat a black hole? Er, no. But she does have some important lore to share and a galaxy-saving scheme up her flowing sleeves! Turns out there’s been a holy Sailor War going on since time immemorial between the cHaOs! and the Sailor guardians. A long time ago, a Legendary Guardian sealed the cHaOs! using a sword known as the “Light of Hope,” but the cHaOs! (okay, sorry, I’ll stop) broke free recently and is now chowing down on star seeds across the galaxy. Fortunately there is a way to stop her: Find the Legendary Plot Device’s Light ex Machina and use its power to seal away the chaos again. Kakyu asks everyone to put aside their differences and selfish desires in order to save the universe–to which Taiki and Yaten be like “Eff that! We just wanna get our planet back!” and Haruka and Michiru be like “Eff that! Find your own stupid universe-saving plot device! Our princess has, like, homework ‘n’ stuff!” Basically HaruMi think Kakyu is asking too much of Usagi, which is a little sweet but mostly just patronizing. How many times has she saved the world? I think she can handle a galactic treasure hunt. Speaking of patronizing, with Usagi’s star seed in jeopardy, the Moonies (hearts very much in the right place) become her personal security detail, with Rei even developing laser hearing so she can come running from her own school any time Usagi blows a whistle. It’s cute, but it makes Usagi feel “unreliable,” even more so when the Moonies mention Mamoru. Determined to prove she can handle being on her own, Usagi leaves her friends so she can be lonely on a rooftop. And if anime has taught me anything, it’s that nothing bad EVER happens on school rooftops. The problem is that Usagi actually isn’t fine on her own. One of the things I like about Sailor Moon is its focus on teamwork and the importance of trusting and relying on others, but sometimes they push on this so hard that the characters–particularly Usagi–just look incompetent. 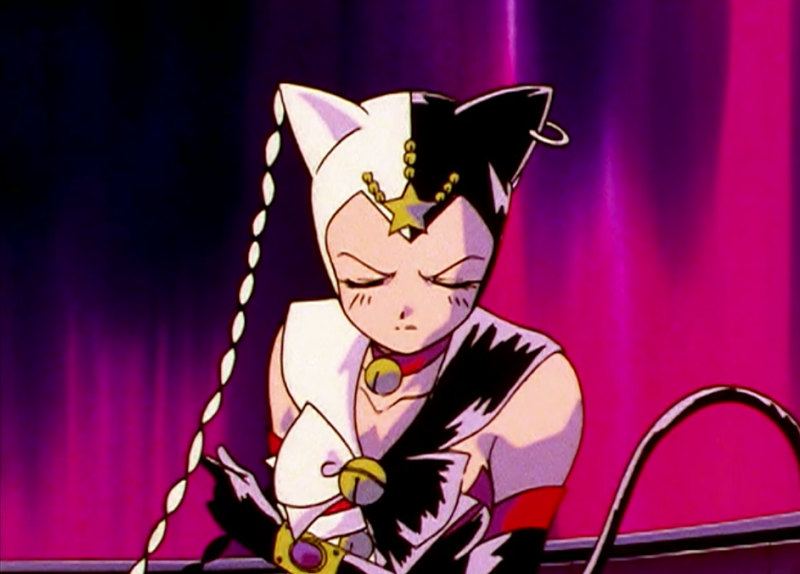 So when Nyanko shows up to starvest, instead of escaping or remembering her friends and finding the strength to hold her own, Usagi’s completely out-matched and immediately needs someone to bail her out. And, despite constantly promising to protect Usagi, the guardians once again do nothing, meaning the person to save her is gonna have to be WAIT WHOA WUT. And then my heart gave out right along with Usagi’s and it was all I could do not to crumple to the ground, cursing our cruel, cruel writers. With Star Fighter’s help, Sailor Moon shatters one of Nyanko’s bracelets but can’t take her out completely, and our minion flees back to base to regroup. All the Tux imagery is too much for Usagi (I hear ya, kid) and she breaks down, admitting to Seiya she’s been putting on a facade of independence but, in truth, “can’t do this alone,” and it’s pretty obvious she’s only talking about romantic partners here. My feelings about this are…mixed. I think it’s very human and totally fine for Usagi to miss Mamoru, and even good for her to admit that she needs the help and support of others, but… it’s just… Usagi isn’t alone. She is surrounded by people who love her and want to help her, and one of my biggest pet peeves in fiction is this idea that romantic partners somehow provide a “better” or more fulfilling relationship than friends or family. I really hope Sailor Moon pushes on this at least a little in the coming weeks, as the series has done a really good job up till now of showing the different-but-equal importance of romance and friendship, and I’d hate to see it lose sight of that down the stretch. Back in the story, Seiya wonders if he could possibly take Mamoru’s place, and after months of overseas silence, Usagi looks like she might be thinking about it. Be strong, Usa! Think of your miracle romance! Think of your daughter! Most of all, think of the time paradoxes! THE TIME PARADOXES! The real episode title for this one is “Princess Kakyu Perishes,” and when I read that I laughed out loud. So basically she showed up just long enough to drop some phat exposition beats and encourage the Stars to play nice with the Moonies, then dies without ever having a chance to develop a personality past “idealized monarch.” Man. And I thought Chibi-Chibi was a lazy plot device. But that comes at the end. First, Rei confronts Usagi about Seiya’s proposal, reminding her of her honey-bunny overseas. To which Usagi replies with the biggest surprise of the season: The reason the other Moonies haven’t been worried about Mamoru’s silence is because SHE NEVER TOLD THEM. The Moonies are naturally concerned both for Mamoru and Usagi, who “shouldn’t have dealt with that alone” (this week’s running theme, it seems). They do the thing Usa should’ve done episodes ago and call his university in the U.S., only to discover he never arrived. But before they can deliver this terrible news to Usagi, other terrible things have to happen: The Star Lights’ farewell concert. Usagi goes to say goodbye, Team Debbie Downer (HaruMi) in tow, and learns that the Lights intend to use their music to try to call upon the Light of Hope and save the galaxy. If this doesn’t work, there’s a good chance we’re all doomed. But that’s not important right now. No, what we need to focus on is the Two Lights smack-talking HaruMi, and Seiya belting out his feelings for Usagi both on stage and off of it. Princess Kakyu is just screaming internally this entire episode, isn’t she? Their concert does begin to awaken C.C.’s inner light, and it does seem to be full of hope…but it also calls down Nyanko, who’s gonna get Usagi’s star seed or die trying! Well, half of her thinks so, anyway. Second biggest surprise of the season: Our “evil” Sailors aren’t evil at all! Galaxia is mind-controlling them with those bracelets! Revealing this earlier and integrating it into the story would have given our villains some much-needed depth and pathos, but it’s still retroactively pretty depressing. Galaxia is extra special levels of evil. After some forced drama, the Moonies and Lights FINALLY have a legitimate disagreement–the Lights want to take down Nyanko while the Moonies want to find a way to cure her–until Usagi and Kakyu remind them of what I’m been saying for weeks: They’re on the same damn side and should work together. Usagi accepts Kakyu’s friend request, the others look ready to honor their princesses’ treaty, and it’s all sunshine and rainbUH-OH. Yeah, Galaxia wasn’t kidding about being impatient. 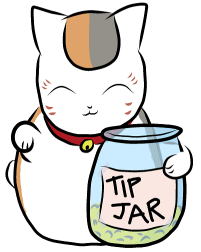 She follows Nyanko to the battleground and murders her face. Then she tries to murder Usagi’s face. But Kakyu steps in and holds her off to give the others time to escape. But instead of escaping, they stand around and watch Galaxia murder Kakyu‘s face. Galaxia snags Kakyu’s true star seed and promises to murder all of their faces next, whereupon she…leaves them alone to mourn and regroup? That’s the Living Embodiment of Chaos for you. Full of surprises. WHAT IS WRONG WITH ME, WHY WOULD I EVEN SAY THAT. We’re gonna have ourselves a busy five episodes, huh? I tend to exaggerate for comedic effect when I write these, but I really did get exactly that excited and exactly that disappointed during The Tux Tease. I miss that dapper dork so much more than I ever thought I would. I’m sure you’re all sick of hearing me complain about how insufferably dumb HaruMi have been as of late, so I kinda skimmed over it in the post, but rest assured that when they were struggling to fight Nyanko and TOLD THE THREE LIGHTS NOT TO HELP THEM BECAUSE THEIR STUPID PRIDE IS MORE IMPORTANT TO THEM THAN THEIR FRIEND’S LIFE, I had to bite back a scream. Hark! A plot point! Sailor guardians are “reincarnations of the planets.” I had originally decided not too think to hard about this, but then I did anyway, and it actually does makes sense as long as I squint my eyes a bit and approach it from a Shinto-Buddhist fusion perspective. It would take too long to explain in a bullet point, but keep in mind that kami can be anything, even inanimate objects, and then go here and read Section B. Basically, think of the planets as kami and the guardians as reincarnations of those, and it mostly works. That tease had me for a moment too. I think we’re in for a pretty tense conclusion. Batman V Superman was great. My mom went the Hospitle but was sent right back, just dizziness and anxiety. I have a Count of Monte-Cristo fan fic online if you’re interested? Starting Eugenie Danglars and Louise d’Armilly called The Piano Maidens. Oh, something I just noticed looking at your recap. Rei’s school uniform has a much shorter skirt yet she’s going to the Catholic school. That princess is so pretty. This series became so weird in its second half, with so much filler for so little character development. Makes me wonder what she may have been like had she stayed long enough to develop herself into an actual person. Okay … the whole mentioning about Galaxia showing up and “murdering everyone’s face” had me roaring with laughter! Another excellent summary – I don’t comment much on these posts but I have been reading them from the moment I first came across the blog, so thanks for them!